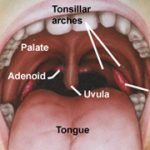 Home » Sleeping Q&A » What’s a pharynx? And what is the connection with sleep apnea? The pharynx can be difficult to grasp for some people. It is roughly 12-15 cm tube like structure (not closed tube) in the back part of the mouth or in the throat. It starts actually from the back of the nose where it is the widest and goes down while narrowing passing the back of the mouth, passing the larynx and finally connecting with esophagus. In the case of obstructive sleep apnea there can be an obstruction in the pharynx which blocks or impedes the air passage. In the case of having a surgery which tries to cure sleep apnea (Uvulopalatopharyngoplasty or sometimes people could wrongly call it tonsillectomy), the doctors can remove some part of the pharynx in the hope of increasing the air passageway and solving the apnea problem. That’s a very nice, short and clear post on the pharynx and the connection with sleep apnea – thanks.